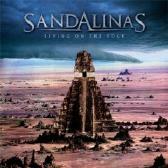 From the moment the laser hits the reflective side of the CD, Sandalinas' "Living on the Edge" will grab your attention and hold it as in a vice throughout its entire nearly 40-minute running time. An instantly addictive meld of power metal, progressive metal, AOR and more, "Living on the Edge" is buoyed by the stunning work of its namesake, Jordi Sandalinas, incredible songwriting (mostly by Sandalinas) and absolutely brilliant production (courtesy of King Diamond's Andy LaRocque). Ranging from crushing, powerful rockers a la Iron Maiden (i.e., the title track and "The Conqueror") to surprisingly sensitive songs that still pack a powerful punch ("If It Wasn't For You") and even a bold ballad ("The Day the Earth Died") and a gentle one ("Heaven in You"), "Living on the Edge" delivers a big, monstrous sound that never lags or is never overbearing. Fans of the above-mentioned genres (power metal, progressive metal and AOR) will find this CD irresistible. Sandalinas: Apollo Papathanasio - vocals; Jordi Sandalinas - guitars; Xavier Monfort - bass; Xavier Perez - drums; Narcis Palahi - keyboards. For more information, check out www.sandalinas.com.